Here is a list basic Math Terms arranged by Topics. I hope you find it useful. Click here to go to the Number Sense topic. These are numbers written in symbols (ex. 1, 2, 3...) in contrast to numbers written in words (ex. one, two, three...). These are consecutive numbers starting from 1 (ex. 1, 2, 3...). Click here to learn more on Counting Numbers. A number line is a horizontal line with markings to show the position of numbers relative to each other. The numbers on the right of the line are bigger than the numbers on the left. An odd number is number with the digit 1, 3, 5, 7, or 9 in the 'ones' place. Examples of odd numbers: 5, 11, 45, 267, 4209, 9000. 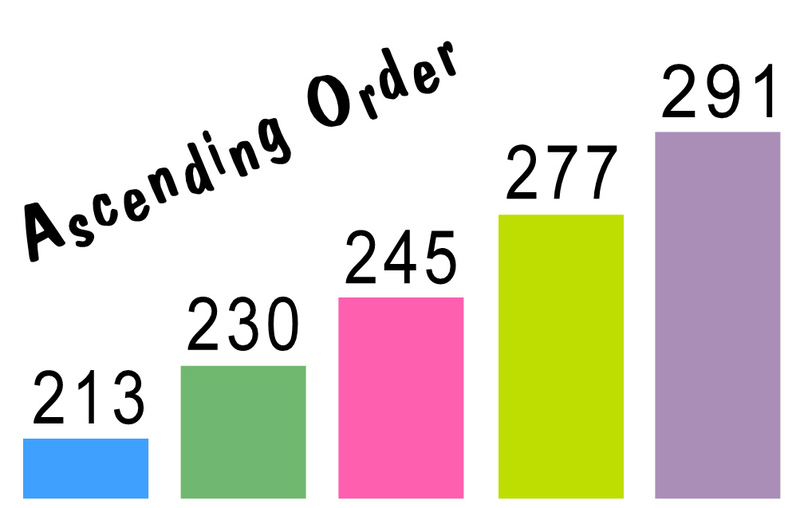 To write numbers in order means to write them in a particular sequence, either in ascending order (from small to big) or descending order from big to small). Click here for learning materials. Writing numbers in ascending order means writing the number in order of size starting with the smallest. You can think of ascending order as going up a flight of stairs or getting bigger. 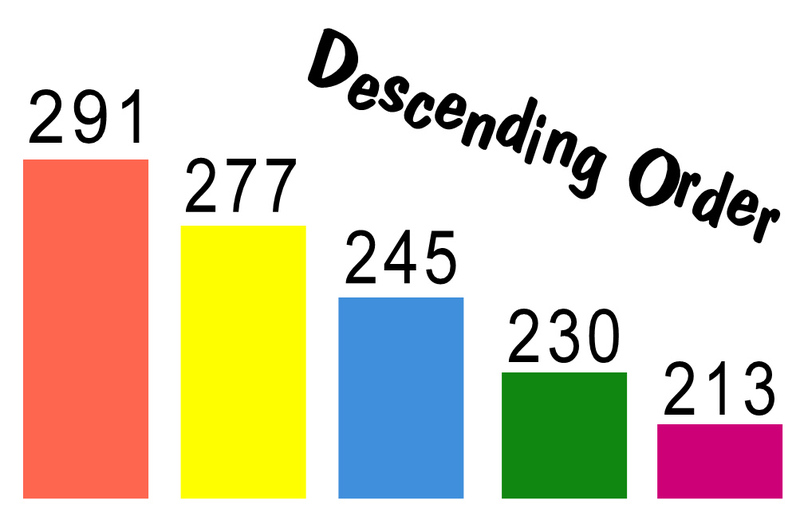 Writing numbers in descending order means writing the number in order of size starting with the biggest. You can think of descending order as going down a flight of stairs or getting smaller. This Math term refers to numbers that appear in running order (ex. 10, 11, 12...). The difference between each consecutive number is one. These are even numbers that appear in running order (ex. 2, 4, 6...). The difference between each consecutive even number is two. These are odd numbers that appear in running order (ex. 7, 9, 11...). The difference between each consecutive odd number is two. These 2 Math terms explain how numbers are formed. Numbers are made up of digits (0, 1, 2, 3, 4, ... 9). 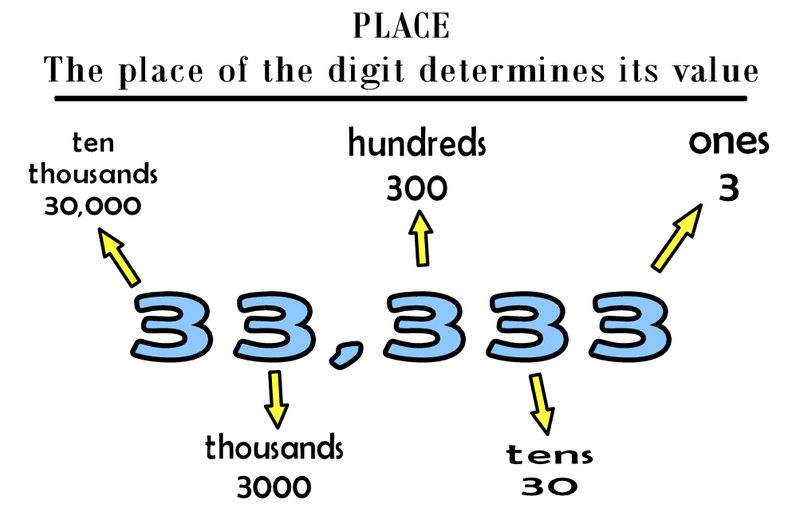 The value of each digit depends on its place or position. For instance, the digit 2 in the 'tens' place has a value of twenty and a value of two if it is in the 'ones' place. 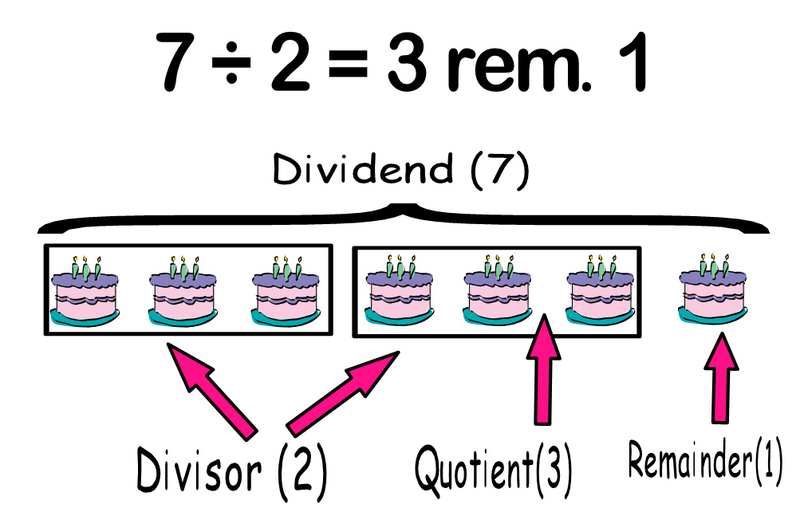 An addend is a number on the left hand side of an Addition Math sentence or equation. 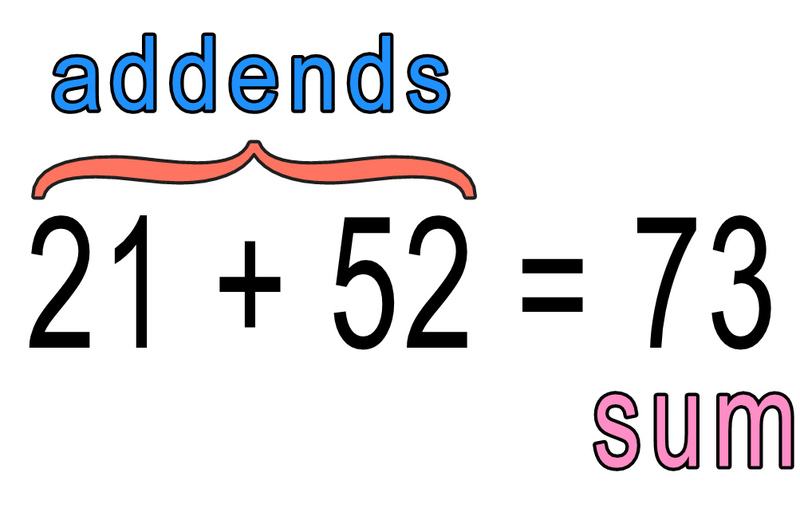 In this example: 21 + 52 = 73, the addends are 21 and 52. Addition is a basic Math operation. To add means to combine numbers to form a bigger number. When we add, the addends are always smaller than the sum. This Math term occurs often in problem sums. 'More ... than' also means 'bigger than' or 'in excess of' or 'extra'. If John has more stickers than George, this means the number of John's stickers is bigger than the number of George's stickers. We usually, but not always, use addition with the term 'more ... than' in a problem sum. You find the difference of 2 numbers by subtracting the smaller number from the bigger (ex. the difference of 2 and 10 is 8. The difference of 10 and 2 is also 8). This Math term occurs often in problem sums. 'Less ... Than' or 'fewer ... than' means 'smaller than'. If John's height is less than George's height, it means the number for John's height is smaller than the number for George's height. We usually, but not always, use subtraction with the term 'less .. than' in a problem sum. Multiply means groups of the same numbers.We can think of multiplication in 2 ways. For example: 2 x 5 can mean 2 groups of 5 or two 5's. This is the same as 5 + 5. Or 2 x 5 can also mean 2 in a group, 5 groups altogether. This is the same as 2 + 2 + 2 + 2 + 2. A multiple is the result of a multiplication. For example, the third multiple of 6 is 18 (the result of multiplying 3 and 6). "Can 5 be multiplied by any number to give the answer 24?" If the answer is yes, than 24 is a multiple of 5. If the answer is no, then 24 is not a multiple of 5. A common multiple is a multiple that occurs in all the numbers being compared. There is an infinite number of common multiples between numbers. Example: What are the first 5 common multiples of 2 and 3? When we want the LCM or Lowest Common Multiple of 2 or more numbers, we want the first multiple that occurs in all the numbers being compared. So the LCM of 2 and 3 is 6. This Math term refers to the result of multiplication. 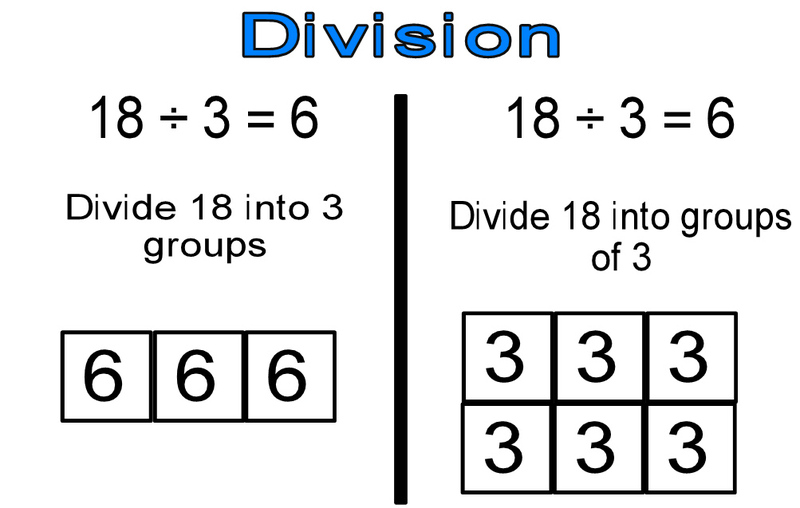 Division is a Math operation where you arrange (divide) a number into groups of smaller numbers. It is the opposite of multiplication. There are 2 ways to think about division. Example: "18 divided by 3 equals 6" can mean if you arrange 18 items into 3 groups you will get 6 items in each group. Or it can mean if you arrange 18 items into groups of 3, you will get six groups. These Math terms relate to division. See the graphics below. 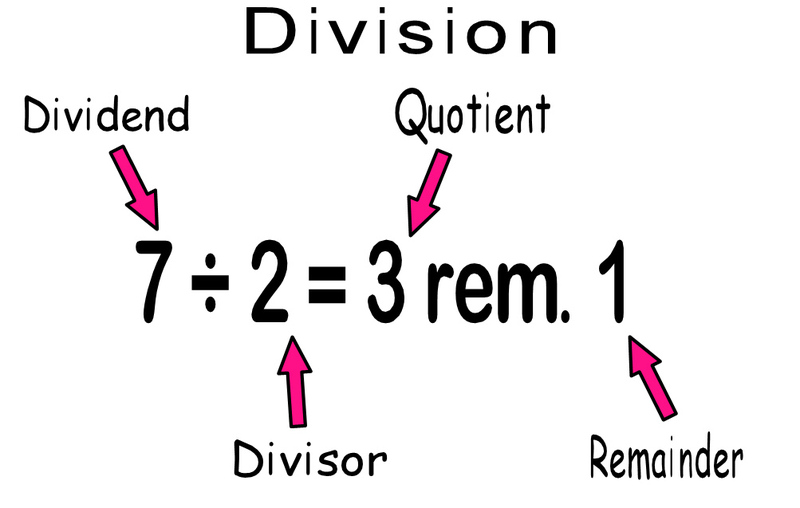 This Math term refers to division. If we ask "Is 26 divisible by 3?" what we mean is "Can 26 be divided by 3 without leaving any remainder?" If the answer is yes, than 26 is divisible by 3. If the answer is no, then 26 is not divisible by 3. 26 is not divisible by 3 because there is a remainder of 2. This Math term is similar to the term divisible. "Can 25 be divided by 2 without leaving any remainder?" If the answer is yes, than 2 is a factor of 25. If the answer is no, then 2 is not a factor of 25. So now we know that 2 is not a factor of 25 because there is a remainder of 1 when we divide 25 by 2. To find out whether one number is a factor of another, we have to divide the second number by the first. If the result is a whole number with no remainder, then the first number is a factor of the second. Sometimes we want to find the common factors of two or more numbers. A common factor is a factor that occurs in all the numbers being compared. There is a fixed number of common factors between numbers. Example: What are the common factors of 12 and 30? These 2 Math terms have the same meaning. If you want to find the GCF or HCF of a few numbers, you first find all the possible factors of each number. Then you choose the biggest factor that can be found in each number. Example: Find the HCF of 24 and 30. The GCF (or HCF) of 24 and 30 is 6. 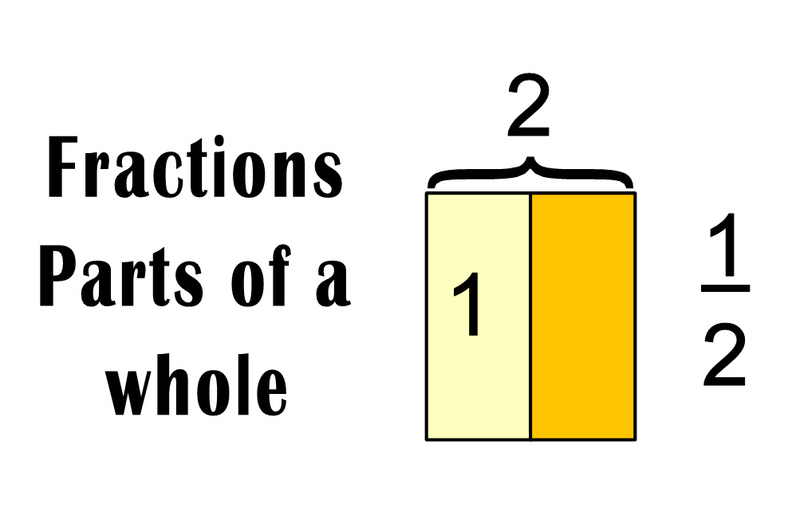 There are two ways to look at fractions. One way is to think of breaking up a whole piece into smaller equal pieces. So half a cake means cutting a cake into 2 equal parts and taking only 1 of the parts.Or one piece out of two pieces. This way is called 'parts of a whole'. The important thing to remember is that each piece must be of the same size as every other piece. 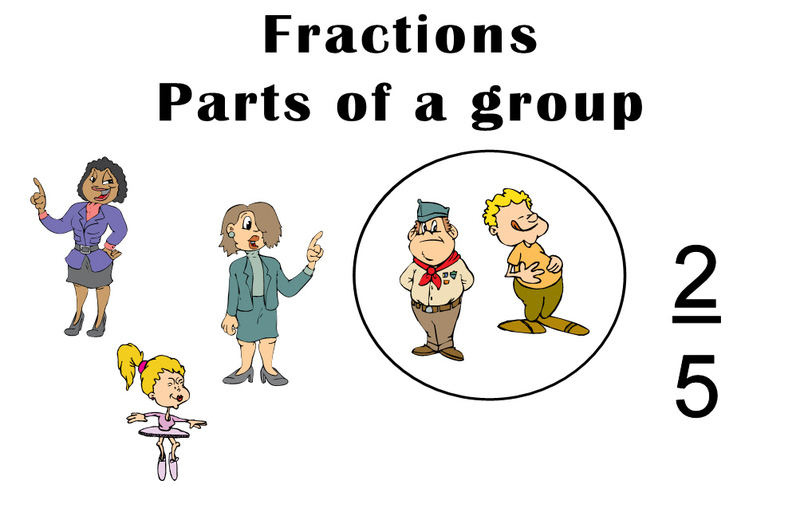 Another way to look at fractions is 'parts of a group' of items. In this case, each part does not have to be the same size. If there are 5 people in a room, two-fifths of them would mean 2 people (or 2 out of 5). Fractions and division are related operations since we are breaking up a large number into smaller numbers. This Math term applies to a fraction. It is the bottom number in a fraction. 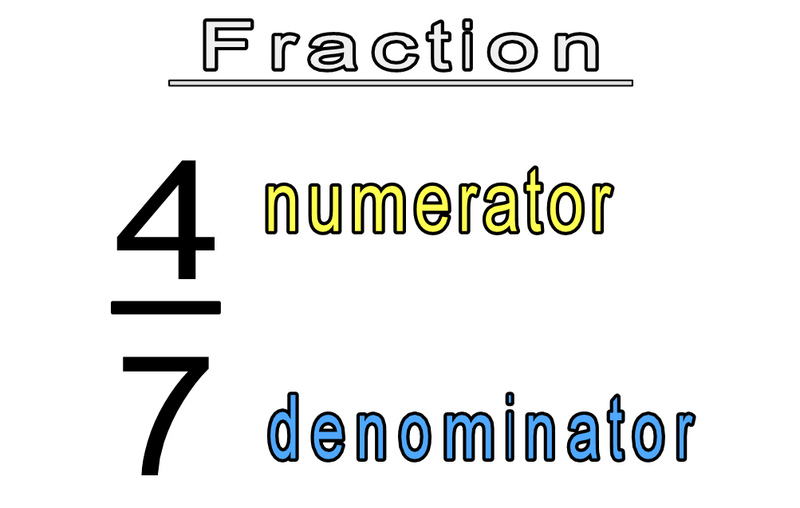 The top number in the fraction is called the numerator. The numerator tells us the number of parts we want and the denominator tells us the total number of parts. This Math term applies to a fraction. It is the top number of a fraction. The bottom number is called the denominator.